Léa Burger (host) is a member of the editorial staff of «RosaRot». She studied Religious Studies and Gender Studies and works as a producer for the programme «Sternstunden» on Swiss Television SRF. Madeleine Marti has been active in the feminist movement since the seventies. She has worked as editorial staff for «Lesbenfront», for the Sappho Society, and as co-organiser of conferences at the Paulus Akademie and at Boldern. She earned a doctoral degree in 1991 with her thesis about lesbians and literature. 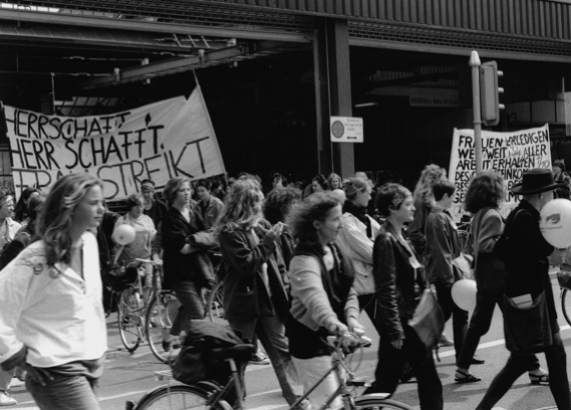 Since 2015 she also co-organises lesbian history walks in Zurich. Bettina Stehli is a historian. She works for frau*m (Frauen*Zentrum Zürich), and since 2011 for «Pandora’s Box», the lesbian programme on Radio LoRa. Heidi Witzig is a feminist and active in the «Grossmütter-Revolution» («grandmothers’ revolution»), freelance historian with a PhD specialising in women’s history, co-author of «Frauengeschichte(n): Dokumente aus zwei Jahrhunderten zur Situation der Frauen in der Schweiz» («Women’s (hi-)stories: documents from two centuries concerning the situation of women in Switzerland», 1986, with Elisabeth Joris), and former town councillor for the SP in Uster. Dolores Zoe Bertschinger spends her time between Switzerland, India and Italy. She studied religious studies, founded feminist reading groups and works for «RosaRot».